Extracts from the Northern Times of October 3rd 1912, republished in 'From Our Old Files in the Sep 28th 2012 edition, concerning a proposed extension to the Station Hotel, Dornoch to provide an additional 26 bedrooms, and the annual boat race for the Littleferry Challenge Cup. 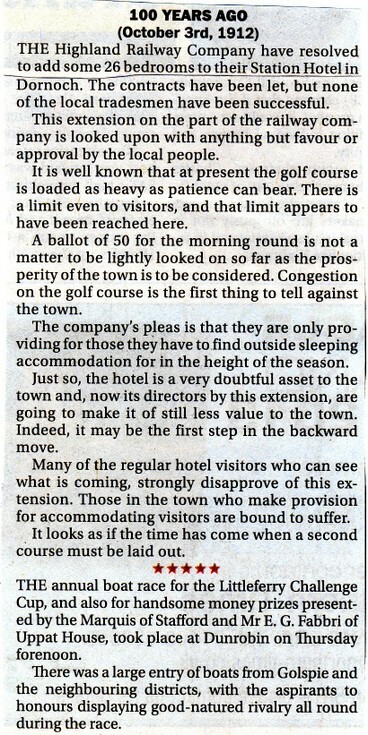 The extract reports the local objections to the extension of the Station Hotel on the grounds "the golf course is loaded as heavy as patience can bear. There is a limit even to visitors and that limit appears to have been reached." and "Those in the town who make provision for accommodating visitors are bound to suffer." The report on the annual Littleferry Challenge Cup records the handsome money prizes present by the Marquis of Stafford and Mr E. G Fabbri of Uppat House and the large entry of boats from Golspie and the neighbouring districts.